Krammer, I'll take the 2-3 yard throws all day! Craig Mager is questionable to return with a hamstring injury. That last Vikings-drive looked positively Childress-ian, if there is such a word to be made up. Gerald Hodges has taken Eric Kendricks' spot in #Vikings ' nickel defense to start this drive. #Vikings mixed around nickel LBs last week when they were in that package for 85% of the plays. Could be similar deal today. Doesn't look good. Orlando Franklin needs two men to walk him off field. Unable to put pressure on left leg. Considering the amount of nickel the Vikings are playing today, I'm guessing Chad Greenway plays even fewer snaps than he did last week. 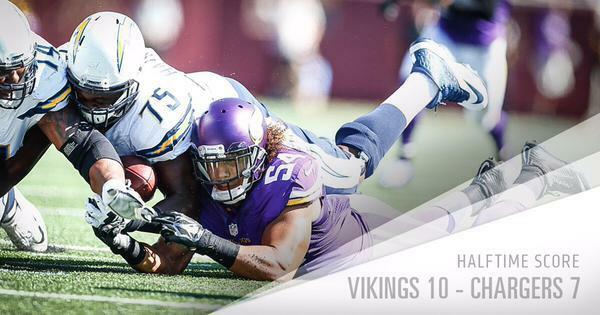 Griffen put the spin move on Chargers LT King Dunlap, sacks Rivers. That's the sixth pass deflection from the #Vikings ' D-line this season.
.@EversonGriffen has at least a half sack in all 3 games in 2015. 7th most sacks (14.5) in NFL since start of 2014. 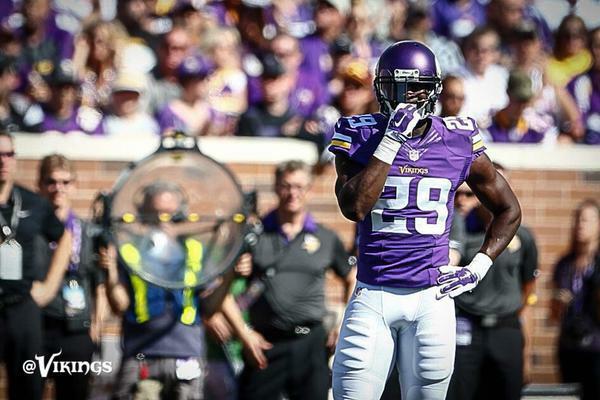 That was just the second 3rd-down conversion allowed by #Vikings today, were 1 for 6 before. Zimmer didn't blitz Rivers that time. Xavier Rhodes is down on the field and not moving after that play. Orlando Franklin has an ankle injury and is questionable to return. Sendejo absolutely killed this ream on that drive. Rhodes is moving his limbs, which is a good sign after that ugly collision with Andrew Sendejo in coverage. Xavier Rhodes is sitting up now. That was a scary injury with his neck snapping back. He's now walking off the field. Rhodes is being walked off with #Vikings trainers. 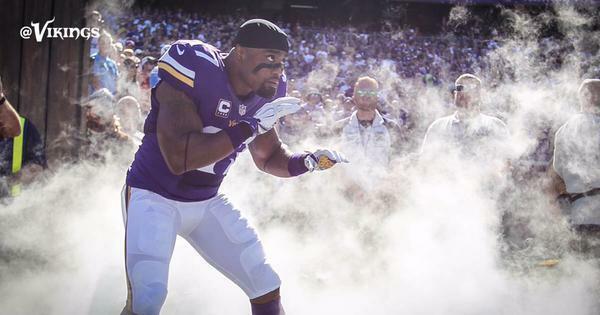 Rhodes is walking to the locker room under his own power.